How does the presence of Nitrates in our water really effect us? Unlike temperature and dissolved oxygen, the presence of normal levels of nitrates usually does not have a direct effect on aquatic insects or fish. However, excess levels of nitrates in water can create conditions that make it difficult for aquatic insects or fish to survive. A bay or estuary that has the milky colour of pea soup is showing the result of high concentrations of algae. Large amounts of algae can cause extreme fluctuations in dissolved oxygen. Photosynthesis by algae and other plants can generate oxygen during the day. However, at night, dissolved oxygen may decrease to very low levels as a result of large numbers of oxygen consuming bacteria feeding on dead or decaying algae and other plants. 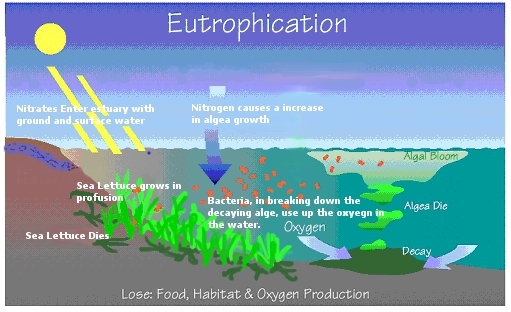 Eutrophication – “The process by which a body of water acquires a high concentration of nutrients, especially phosphates and nitrates. These typically promote excessive growth of algae. 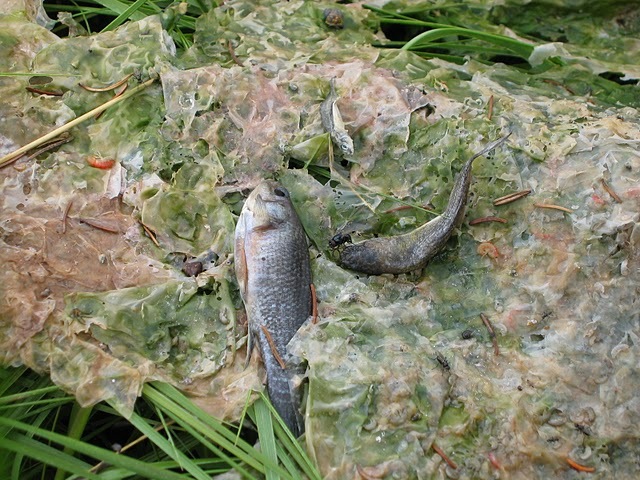 As the algae die and decompose, high levels of organic matter and the decomposing organisms deplete the water of available oxygen, causing the death of other organisms, such as fish. Anoxia – Anoxic Event: Anoxia is a lack of oxygen caused by excessive nutrients in waterways which triggers algae growth. When the plants die and decay, oxygen is stripped from the water, which then turns green or milky white and gives off a strong rotten egg odour. The lack of oxygen is often deadly for invertebrates, fish and shellfish. Why do we need nitrogen? What are the sources of Nitrogen? Nitrogen is essential for all living things: animals and plants. Nitrogen forms a part of the proteins and DNA that are found in cells. Animals get nitrogen by eating plants and other animals. Just like animals, plants require nitrogen to grow and survive. But they do not get nitrogen by consuming proteins like animals do. Plants get nitrogen from water and from the soil. They get nitrogen by absorbing it in the form of nitrates and ammonium. Nitrates are the major source of nitrogen for aquatic plants. Nitrates are not utilized by aquatic organisms such as fish and aquatic insects, but nitrates are used by aquatic plants. All aquatic organisms excrete wastes and aquatic plants and organisms eventually die. These activities create ammonia. Some bacteria in the water change this ammonia to produce nitrite which is then converted by other bacteria to nitrate. Nitrates (NO3-) are an oxidized form of nitrogen and are formed by combining oxygen and nitrogen. Nitrates also come from the earth. Soil contains organic matter, which contains nitrogen compounds. Just like the ammonia in water, these nitrogen compounds in the soil are converted by bacteria into nitrates. Although nitrates occur naturally in soil and water, an excess levels of nitrates can be considered to be a contaminant of ground and surface waters. Most sources of excess nitrates come from human activity. The source of excess nitrates can usually be traced to agricultural activities, human wastes, or industrial pollution. Nitrogen fertilizers have been applied to yards, fields, golf courses to promote the growth of plants. Rainwater can wash nitrates in the fertilizer into streams and rivers or the nitrates can seep into ground water. This can also occur with animal waste and manure. In addition to animal waste, untreated human sewage can contribute to nitrate levels in surface and ground water. Leaking or poorly functioning septic systems are a source of such nitrates. City sewage treatment plants treat sewage to make it non-hazardous, but treatment plants still release nitrates into waterways. In addition, industrial plants and agricultural processing operations are potential sources of nitrate pollution. How do nitrates affect human health? Nitrate concentrations are monitored in municipal water supplies and foods to prevent exposing people to the potential harmful effects of high levels of nitrates. Nitrates are highly soluble, meaning that they easily dissolve in water. For many people in rural areas, the primary source of drinking water is well water, which may be contaminated with nitrates. Nitrates are colorless and odorless, so their presence cannot be determined without the use of special testing equipment. Nitrates can interfere with the ability of our red blood cells to carry oxygen. Infants are more at risk of nitrate poisoning than older children or adults. Babies can turn “blue” when there is not enough oxygen being transported by their blood. This “blue baby syndrome” (technically known as methemoglobinemia) is a serious condition that can cause brain damage or death. How do nitrates affect the health of aquatic animals? Fish and aquatic insects can be affected indirectly by increased nitrate concentrations in the water. Basically, any excess nitrate in the water is a source of fertilizer for aquatic plants and algae. In many cases, the amount of nitrate in the water is what limits how much plants and algae can grow. If there is an excess level of nitrates, plants and algae will grow excessively. Excess plants in a body of water can create many problems. An excess in the growth of plants and algae create an unstable amount of dissolved oxygen. During the day, there will be usually be high levels of dissolved oxygen, and at night the levels of oxygen can decrease dramatically. This will create stressful conditions for fish. If they are stressed for a significant part of the day, they will not behave normally or reproduce. If the conditions persist for a long period of time, the stressed fish species may choose to leave that area or die off. Excess algae or plant growth is also unsightly. If you’ve ever been to a beach where mats of rotting algae wash up on shore or the bottom of the lake is teaming with weeds, it’s probably because excess nitrates are available for plant growth. Excess plants and algae will also create conditions where organic matter accumulates. High densities of algae will create a condition where sunlight cannot reach very far into the water. Since plants and algae require some sunlight, plants and algae not receiving sunlight will die off. These dead plant materials will settle to the bottom of the water and bacteria that feed on decaying organic material will greatly increase in numbers. These bacteria will consume oxygen and, therefore, the level of dissolved oxygen in this water will fall to levels that are too low for many aquatic insects and fish to survive. Also, this can cause extreme changes in habitat. Fish that need gravel or sand for spawning may find nothing but mats of vegetation and muck so will be unable to produce offspring. PEI – Rivers on PEI with anoxic events. PEI News Items on Wheatley River Anoxic Events.